Rent a bike. The locals will tell you that it’s a 45 minute ride—they’re lying. It wouldn’t take that long if you walked the bike. If you’re up for it, pack food and a blanket and get to the temples early enough for a sunrise picnic. It’s worth the nap you’ll need later. Enjoy Siem Reap while you’re there. Have breakfast at The Paper Tiger. Have drink at Angkor What? Bar. If you find the lady selling passion fruit sorbet on a narrow side street buy it. It’s magical. 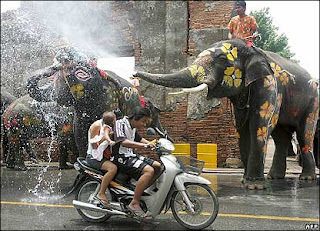 Songkran celebrates the Thai New Year (April 13-15th). According to tradition monks gently pour a mixture of water and Thai fragrance over a person to bring good luck in the coming year. This still happens behind the protected walls of the temples. On the streets of Chiang Mai it’s every man for himself. 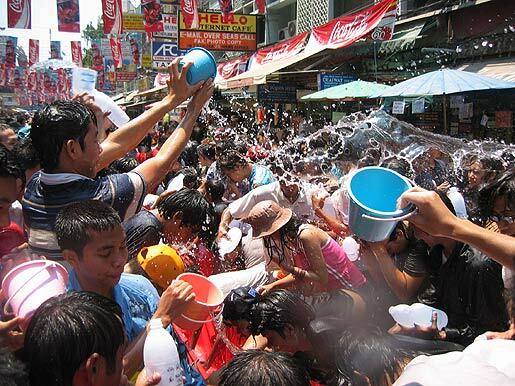 Songkran celebrations can be found throughout Thailand and Laos but nothing comes close to the madness in Chiang Mai. For nearly a week the whole of the old city becomes the world’s biggest water fight. The streets are packed on both sides with people firing water guns and throwing buckets of moat water. The passing cars and scooters are armed as well. Tourists attack with any water they can get their hands on. The Thai people think ahead and ice down garbage cans full of water to give the farangs a frigid shock. You will get drenched. No part of you will be dry. Do not bring a camera unless it is waterproof. Inside the city walls you are a little safer, but roving bands of Thai kids will probably catch you unaware. After 6 P.M. everyone puts a collective moratorium on the water clash; a time to dry out, eat well, and get ready to do it again when the sun comes up. Anonymous: Is it wrong that I just used the bum gun to refill? Me: No. That’s genius! I’ll be right back. 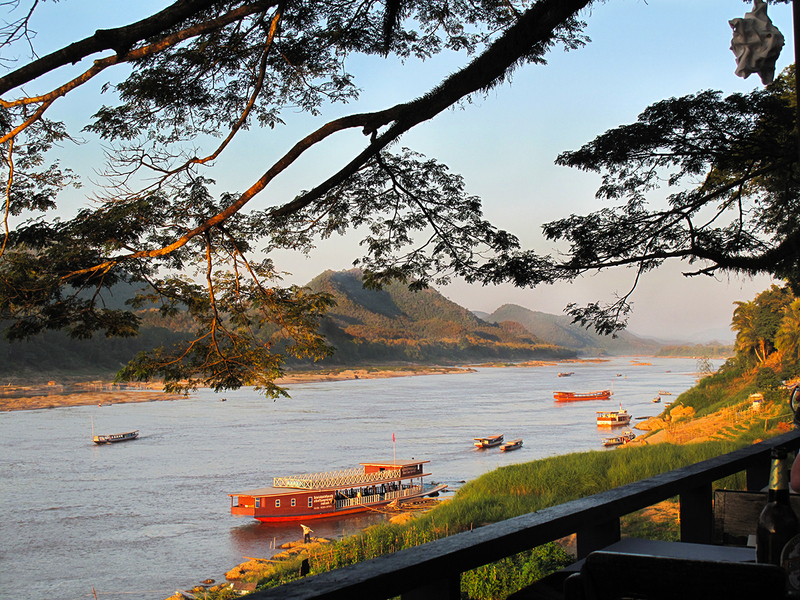 Luang Prabang was one of the jewels of French Indo-China. It’s gorgeous; a sleepy throwback on the banks of the Mekong River. It’s a city of ancient narrow streets, French architecture and South East Asia slowness. Pick a creative outlet; writing, painting, music. Pick a riverside café, there are countless options. Let the day whittle away. Drink too much Laos coffee. Order a baguette and cheese. Forget about everything. Sit and sip and channel all the creative energy you never find the time to tap into. When the sun goes down and your stomach starts to rumble treat yourself to a great dinner and wash it down with a Beer Laos, the best suds in South East Asia. It’s scary. It’s fun. It’s something you’ve probably never done before and might never do again. So why not? If rock climbing isn’t your thing, go to Railay anyway. It’s phenomenally beautiful. If you go during the low season there will be more Thai people there than tourists. If you are feeling adventurous you can rent a kayak, hike through the jungle to Tonsai Beach, or hike up to the view point and down to the lagoon. If you just want to relax you can spend the day reading a book and swimming in the Andaman Sea at Phra Nang Cave Beach before ambling over to Railay West for a fruit shake and an incredible sunset view. Most of the tour boat operators are surly and humorless. The lust for tourism dollars has led to a crowded bay, cave systems bathed in garish purple, pink and blue light, and an overall feeling of being herded and unwanted. However, Halong Bay is so spectacular you’ll find yourself willing to overlook all the mismanagement. Once you’re lounging on the roof of a junk boat watching the emerald bay and limestone karsts unfold awe will overtake the bad parts. In Vietnamese Halong means "Descending Dragon Bay." According to legend, when Vietnam had just started to develop into a country, they had to fight against invaders. To assist Vietnamese in defending their country, the gods sent a family of dragons as protectors. This family of dragons began spitting out jewels and jade. These jewels turned into the islands and islets dotting the bay, linking together to form a great wall against the invaders. You will take 100 pictures of what the dragons left behind and not one of them will live up to what you saw with your own eyes. The food in Malaysia is fantastic. The cultural mishmash of Indian, Chinese and indigenous Malay give the cuisine unparralled variety. Stay away from the fancy places in the city malls. Go down to the markets and street vendors. Eat clay pot chicken at a street hawker stand. Dine at a hole-in-wall Indian joint. Soak up all the flavors of Malaysia in the places locals can afford. The flavors are dumbed down in the tourist traps. On the street you’ll get the real deal. Nestled in the winding hills North of Chiang Mai, Pai is a beacon for hippies and counter-culturalists. Laid back in the extreme, Pai is an easy place to laze away your days on a riverside hammock. And you should definitely do that. Just not all your days. 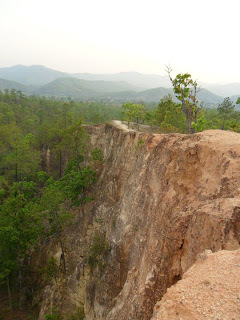 Pai is surrounded by canyons, rolling hills, mist covered mountains and even a few vineyards. The roads are empty and well paved. Rent a motorcycle and hit the open road. It’s hard to find a stretch without picturesque views. Bring your camera and cruise slow. Enjoy the beauty and vastness of Thailand’s mountainous north. There is no shortage of people trying to sell you things in South East Asia. In Thailand its women offering beach massages and henna tattoos while you’re trying to catch some rays. In Vietnam its aggressive men hawking sunglasses shouting, “You! You! Happy Hour” even though it’s not happy hour and you’re already wearing glasses. 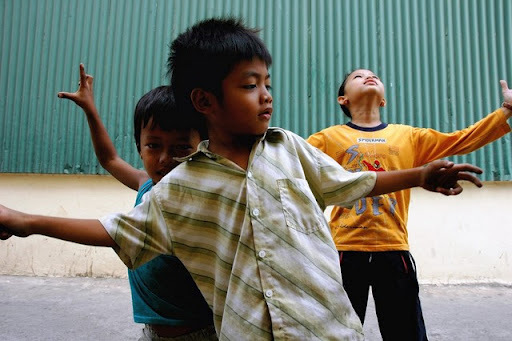 In Cambodia its kids selling everything under the sun. There are many reasons to despise this practice. The kids are dirty and disheveled. They should be in school. Nearly all of their profits go to local gangsters. In many cases they are the family’s breadwinner. It’s tragic. But, no matter how you feel about it, they are going to come at you in waves. You can’t engage all of them, but you can give a few the time of day. Buy a book. Pay full price for it. But, bargain first. Get the kids talking. You will find that many of them are clever, funny and genuinely love the banter. Most people blow them off or refuse to acknowledge their existence. Be playful. For as long as you have that book it will remind you of a place and a child and the words that child spoke. Hanoi is a great and manic city. It has the best architecture in Vietnam and it's go go go all day long. You could risk your life crossing streets exploring the city. Or you could find a busy corner-store that sells Bia Hoi and let the city come to you. Bia Hoi cost about 10 cents a glass. It’s not the best beer in the world, but it is an excellent people watching beverage. In the busy streets of Hanoi you will see it all; insane traffic, vendors carrying their wares on wooden poles, cyclos carrying tourists in ridiculous outfits. Settle into a miniature plastic chair, sip on a few luke-warm brews and enjoy the sights and sounds of Vietnam. Koh Tao is the diving capital of South East Asia. If you are a diving enthusiast the Similan Islands on the Andaman Coast may be more your speed. 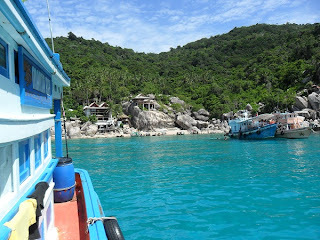 But, if you are a beginner or a novice Koh Tao is the perfect place to explore the bright blue coral depths. Diving in Koh Tao is cheap and easy to arrange. Everyone books dive tours on Koh Tao. EVERYONE. If you ask the lady selling Pad Thai in front of 7-11 in Sairee Beach she can probably book your trip. Walk around and talk to different shops. Many of them have package deals that come with a free night accommodation. Scuba Junction is good. BANS is good. Talk to a handful and see what works best for you. Koh Tao itself is a beautiful spit of an island. From end-to-end it's maybe 5km long (drivable road). On one end is Sairee Beach the tourist center and home to most of the dive shops. On the other end is Freedom Beach a gorgeous bay perfect for snorkeling. See both sides of the island. Check out the view point. Take a day trip to Yang Nuan Island adjacent to Sairee. You won’t be disappointed. 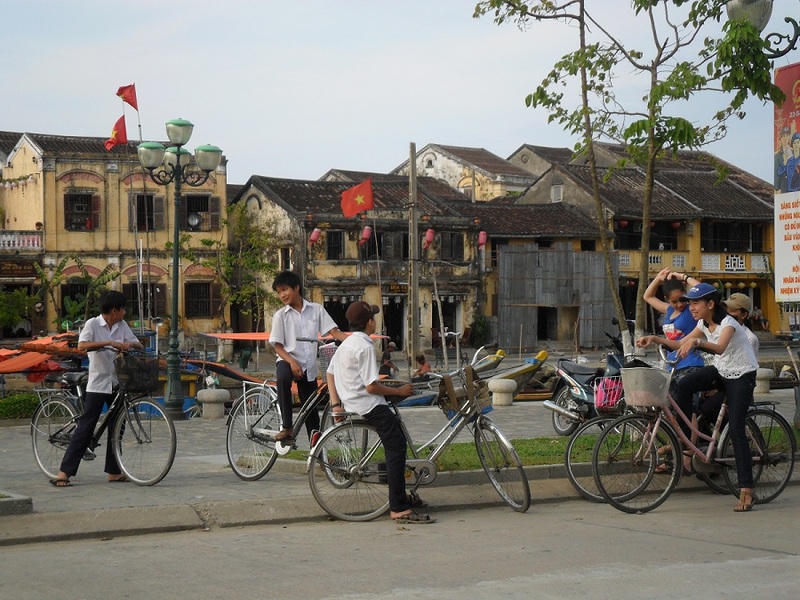 Hoi An was once a major trading player in the French Indo-China region. Its architecture is old and well preserved. It has a quiet tucked away vibe. The kind of place that seems protective of its smallness. You can get anything custom made in Hoi An; jeans, sneakers, suits, dresses, you name it. Take a slow walk through the city, bargain with the vendors and come back to the one that feels right. Hotels will tell you that they have “the best deal” with so and so shop. Maybe they do. Maybe they don’t. You are better off taking your time and trusting your instincts. The Phi Phi Islands (Phi Phi Don and Phi Phi Lay) have some of the most beautiful beaches in South East Asia—none more famous than Maya Bay. 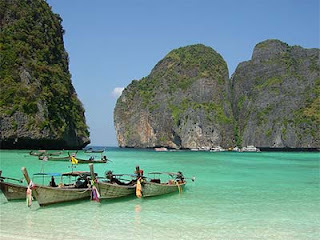 Most people know Maya Bay from the movie The Beach. Maya Bay is an extremely popular tourist destination. Its incredible beauty is sometimes marred by tourists playing Frisbee and screaming, “OMG, it’s just like the movie.” During the high season this is an unavoidable pitfall—unless you stay the night. Sign-up for a camping tour. The beach will be packed when you arrive, but empty when you wake up. A few moments of peace on the most beautiful beach you’ll ever see is well worth a night in a tent. Adjacent to Khao Sok National Park in Southern Thailand, Cheow Larn Lake feels like a smaller Halong Bay, an undiscovered Halong Bay. 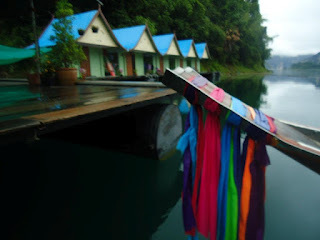 Its waters are clear, cool and surrounded on all sides by limestone cliffs. Hikes into the surrounding areas promise a diversity of flora and fauna. You may even run across a deer recently mauled by a tiger. I did. Spelunk Yeah!! There are a number of floating bungalows on the lake. Most provide both room and board. For less than 40 USD you can spend two days/nights swimming, kayaking, and relaxing in an exotic, strikingly beautiful setting. 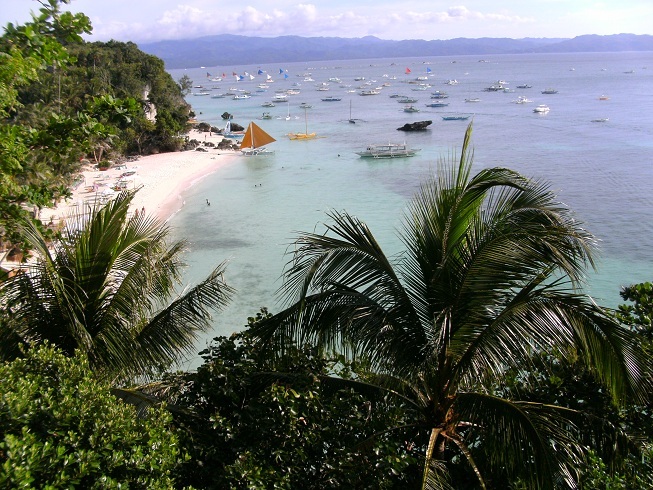 Boracay Island is one of the most popular beach destinations in the Philippines. It's a little over commercialized in stretches, but developers have been careful not to be gaudy. And the further you walk from the main center the more isolated and “what it used to be like” it becomes. No matter where you are, you can have a pizza delivered via catamaran. How sweet is that? 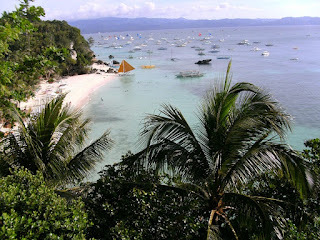 Boracay is beautiful. It has crystal clear waters, tucked-away coves and hammocks strung-up in enviable places. But, its best feature is its sand. Bright white and soft like baking flour the sand is absolute therapy to walk on. Get yourself something cold to drink and follow the white flour road. 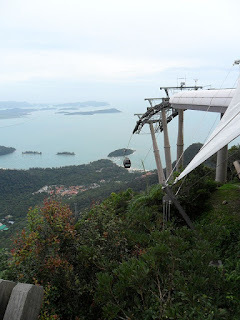 Langkawi is a top-tier beach escape near the border of Malaysia and Thailand. The cable car in Oriental Village is the definition of a tourist trap, but it really does deliver a spectacular view. Take a ride to the top and set your camera to panorama.